Futsal! Sleeping! Chilling! Movies! Shopping! Lazing! No students! No duties! No cooking! No cleaning! I can't wait for this week to be over! All my life, I've looked forward to the holidays. From childhood until adulthood I'm still in school! Should I be ashamed of myself for not moving on to an office or courtroom? That's a question for another blog post. Right now, I'm all for the holidays! It's the joy of doing whatever you want whenever you want. It's all just a few days away! It's even more awesome that this 1 week holiday is adjacent to Merdeka day. I get one extra day off! WOO! I can foresee many teachers happily celebrating Merdeka day this year. Everybody celebrates it in their own way. As for me, I will celebrate it sleeping in bed. The house is clean. The food is cooked. Everything is free! To all the students & teachers out there, Happy Holidays! 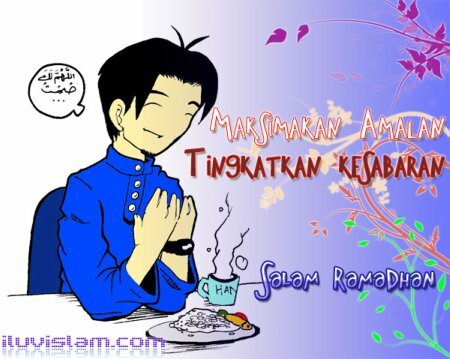 To all my Muslim friends, Selamat Berpuasa!